Adding a shaded or partially shaded area to your home’s exterior will not only increase the value of your home, but give your family a comfortable place to enjoy the outdoors. Retractable roofs offer a covered area with UV protection from the sun, while pergolas offer partial shading and are more permanent structures. Imagine watching the kids play without having to shade your eyes from the sun or just sitting on the back porch reading a book without a blinding glare. Mike Sikora’s Dayton Home Improvement Center can help your family have just that by simply adding a retractable roof or a pergola to your property. Both of these options are custom designed for your home. A retractable roof offers natural sunlight and protection from the sun at the same time. These can be built over a patio, pool area, or sun room or added as a skylight in the home and will enhance your living space. With dozens of designs available, you can add natural lighting to ideal places in your home. This will help to reduce your electric bill by decreasing your need to use artificial light. Retractable roof awnings are ideal if you would like to completely cover a space outside your home. Outside swimming pools can become indoor swimming pools at the touch of a button. You can also create an amazing greenhouse area with a retractable roof. It is important when considering a retractable roof that you consult a home improvement specialist to determine if the area you would like covered is one that will work with this type of roof. If not, you do have other options. 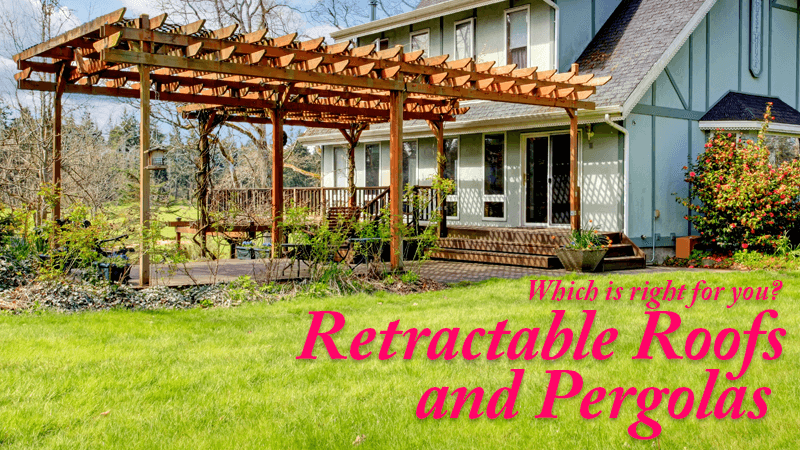 A pergola will help you create a shaded area on the exterior of your home as well. A pergola is an outside archway or arbor. These structures are common in gardens and covering porches, offering partial shade or total shade depending on how they are built. Wooden beams break up the natural sunlight, providing shaded areas while still allowing sun and weather to pass through. These structures are even more beautiful with hanging plants or even climbing ivy to accent the cover. Though mostly made out of wood, there are also metal pergolas available. Both options are either free standing or attached to the house for added support. This option is not easily moved and does not offer the same versatility that retractable roof awnings do. They enhance your area with a natural look and feel while still offering you protection from the sun. With a pergola, you add value to your home and enhance your family’s back yard experience. When you are considering enhancements to your home’s exterior, it is beneficial to consult with a professional. Mike Sikora has been in business since 1973 and has the knowledge and experience to help you navigate upgrades like these to your home.